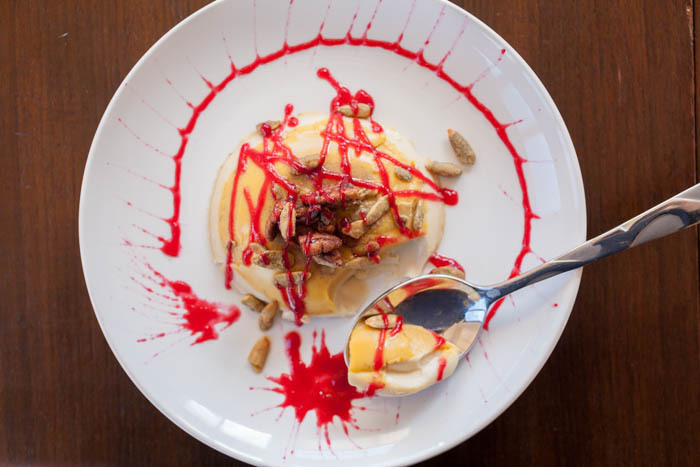 From the turkey to the stuffing to desserts like pie and pumpkin panna cotta and even stirred into oatmeal, this coulis’ flavor makes it perfect for everything. It’s also quick and easy to cook and can be made days (or weeks) ahead of time! A coulis is a type of sauce made from any type of berry: raspberries, blueberries, blackberries, or cranberries. The fruit is boiled down with a bit of liquid and sugar, then mashed through a strainer so it becomes a smooth, slightly thickened sauce. 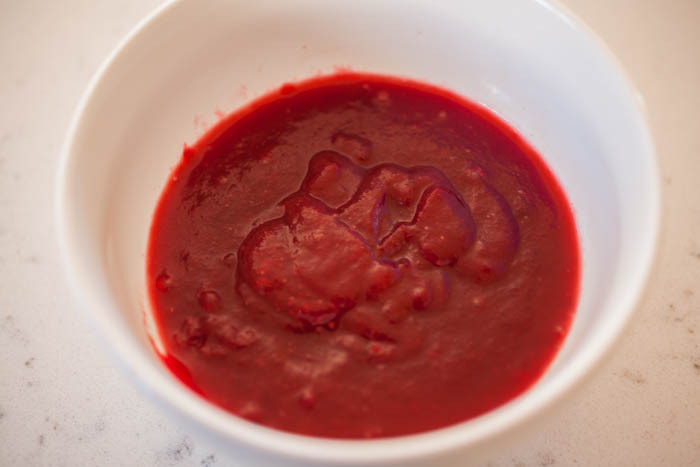 Coulis are used to top savory sauces and desserts alike! They’re kind of one of my favorite ways to add another layer of flavor to a dish! This is another dish that leaves the level of sweetness up to you. I like my sauce a bit tarte because it’s a nice balance to sweet desserts, but with just enough sugar to add a hint of sweetness to savory dishes like turkey or stuffing. You can also increase the sugar. 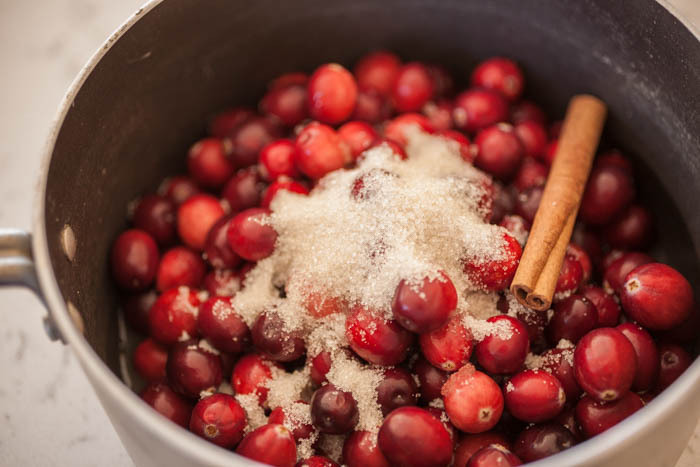 I use ½ a cup of sugar and about a cup of apple cider (I started with ½ a cup and added more because the cranberries were getting too dry and in danger of burning in the pot). You can even reduce the amount of sugar, too, depending on your love of tart. Also, you’ll need a strainer placed over a bowl. You’ll mash all of the sweetened, softened berries with a spatula through the strainer to get all of the sweet coulis. You’ll know you have most of the juice when most of what you see is skin. And don’t stress out about getting every little bit of juice—you won’t. Be sure to scrape the bottom of the strainer, however, because juice clings there. From there, you can use a squeeze bottle, spoon, gravy dish, or piping bag to add the coulis to your food. It keeps in the fridge for a week or you can freeze it for up to six months! 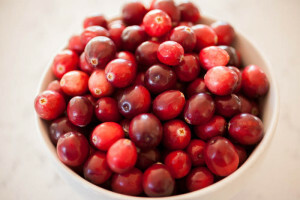 A last note: be careful of the spitting cranberries! I had to turn my heat down from medium-low to low because the higher heat was causing the cranberries to spit hot juice at me. Not fun. The temperature will depend on the power of your stove. This recipe for cranberry coulis is full of seasonal flavors like cranberry, cinnamon and spices! It’s tart, sweet, and a perfect accompaniment to any dish on your holiday table, whether dinner or dessert! 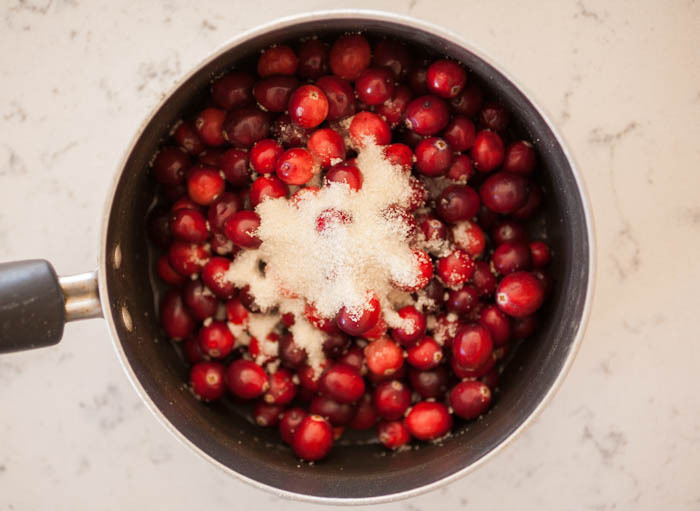 Combine the cranberries with ½ a cup of apple cider, the sugar, cinnamon stick, and vanilla in a sauce pan. Place over medium low to low heat. Stir every couple of minutes or so, just be careful of the spitting cranberries! Add extra cider if the liquid gets too low. 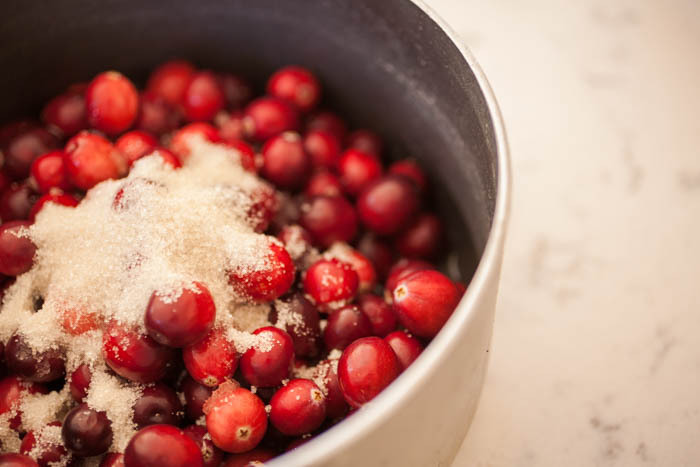 Once all the cranberries have softened, about 10 minutes (check by gently squishing one with the back whatever with which you are stirring), place half of the mixture into a strainer placed over a deep bowl. 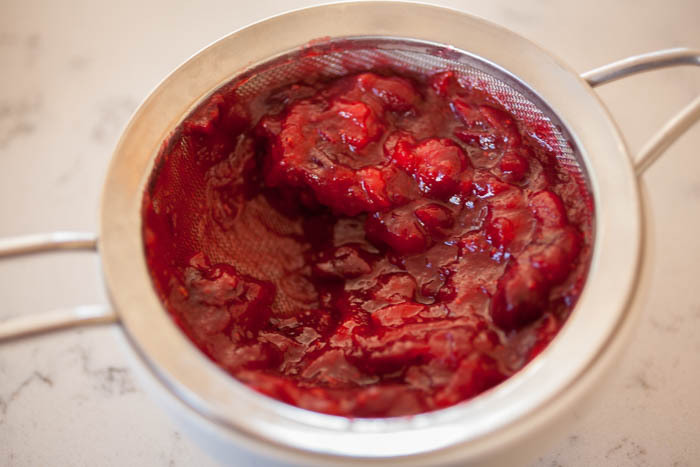 Start pressing, stirring, and swirling the cranberries into the mesh until most of the juice is gone. Replace with the rest of the cranberry mixture.